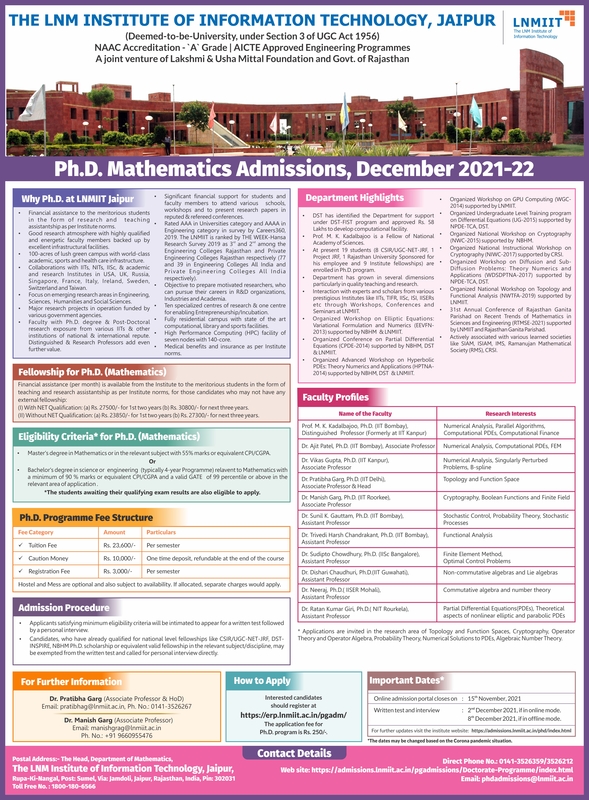 The mission of the Mathematics Department at LNMIIT is to have a positive and lasting impact of Mathematics education with its particular stress on applications of Mathematics to diverse areas of Science and Engineering in meeting today's dynamic challenges in the state of Rajasthan and within India through innovative research that has worldwide impact and recognition. To produce qualified graduates who are equipped with deeper insight and research skills in the field of Mathematics. To encourage scientific research and publications. To encourage participation in scientific forums and seminars and to encourage follow up of latest scientific research and techniques in Mathematics. To encourage interdisciplinary research with other areas such as statistics, operation research, physics, branches of engineering etc. To develop the independent research and analytical thinking abilities of our students along with research-based developments in teaching and education reform efforts. To increase the visibility of LNMIIT in the local community, the state of Rajasthan, and within the nation through competitive and high quality education that produce leaders in science and/or mathematics through doctoral/M.Sc. Programmes. To leverage the diversity of our faculty through the integration of ongoing scientific/mathematics research with our innovative research and leadership. To utilize the diverse expertise of our faculty both within the departmental and in collaborative efforts with other departments, institutes & universities to strengthen the overall quality of the department and to develop professional bonds.